Enter the door on the Tree of Life. Continue forward and through the doorway for the final boss fight. Double slash – He will slash twice with his giant axe out in front. Overhead slam – He will leap at Death and do a big overhead slam. Corruption punch – he can shoot out a tendril of corruption to hit you from a great distance, he can also use this and swing in a wide circle. Corruption wave – The Avatar will stick his hands to the ground and send out three waves of corruption in front. Make sure you stand between these to avoid getting hit. Tentacle grab – Slams the ground, the tentacle will emerge beneath you and hold you in place. Mash the button indicated to escape. The Avatar of Corruption is quite an easy boss and although his moves can do a lot of damage, they are for the most part not too difficult to avoid. Simply dodge the corruption waves and tentacle attacks that he does and lure him into doing his melee attacks, as with mosrt enemies he will pause for a second after unleashing one of these, so take the opportunity to put a few melee attacks of your own in on him. When he has taken enough damage (his health will be around 75%), he will sink to his knees. Use the execute button for a scene. Continue with the above strategy and repeat until he bites the dust and a cut-scene plays. 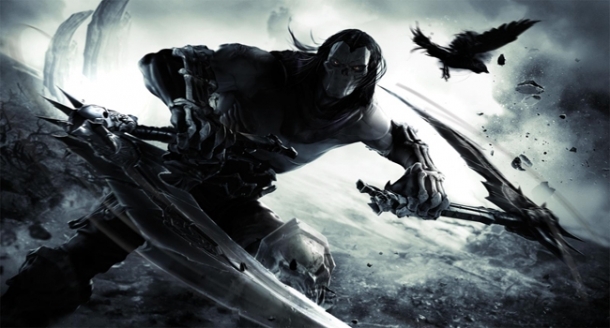 Congratulations, you have just completed Darksiders II! Note: At this point, you will earn the achievements/trophies “The Big Boss” and “A Stroll in The Demonic Park”. If you played the game on normal difficulty, you will also earn the trophy/achievement “Four My Brother” and if you have just completed it on apocalyptic difficulty you will earn the achievement/trophy “A True Horseman”. Be sure to keep watching after the credits for an intriguing additional scene. Additionally, as rewards for completing the game, Nightmare mode and New Game Plus will be unlocked.